In the United States, Mickey D’s delivers mass-produced burgers that are anathema for Jews who obey scripturally mandated kosher dietary laws, which demand specific methods of slaughtering cows and cooking meat, enforced by rigid Rabbinic inspections of food-preparation facilities. These procedures are simply too restrictive for McDonald’s to bother obeying. So, for an American child in an observant Jewish environment, the Golden Arches are always out of reach. Some young Jews say they even felt taunted by McDonald’s boasting about its many customers — you know, the billions-and-billions served counts on the signs, teeming throngs who had done something these kids could not. “It just seemed to me that if a company was serving however many billions of hamburgers a year, they knew how to do a good burger,” says Avi Berkowitz. 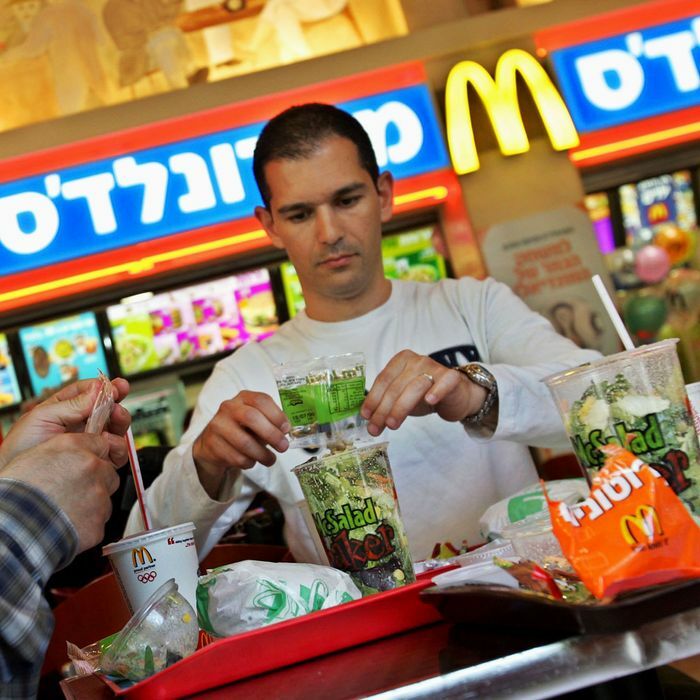 Tuesday arrived, and Reisman set foot inside a sanctified McDonald’s in the Jerusalem suburbs. “It was exactly like what I saw on TV,” she says. “We definitely took pictures. It was Web 1.0 back in 1999, but today we would have Instagrammed the crap out of it.” She sauntered up to the counter, ordered a burger, and bit in, finally putting an end to her 17-year exclusion.